During the regular season, if my team is elite (such as the West Division Champion Rampage are), I’m more of a process over results guy (I become a results guy once the playoffs start). The April 4th Adirondack loss didn’t really bother me, because the team just came out flat. In a 76 game season, your team will come out flat at least 5 times no matter what. This is especially true in a league such as the AHL with funky schedules, insane travel and where you don’t have primary access to your arena. There is really nothing you can do about those five games. To me that is a results loss, and there I’m not going to really get bothered by it. 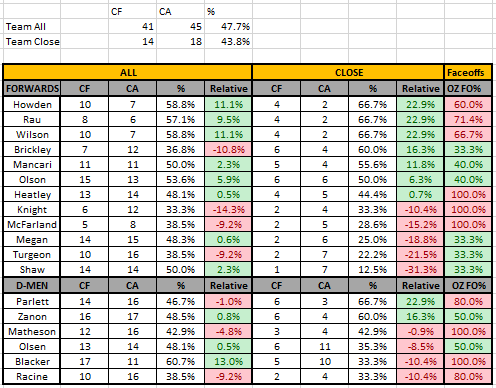 This game versus the Griffins was one of the most frustrating losses this season to me, because it was a process loss. The Griffins were the better team at even strength for most of the game, however the Rampage broke the deadlock first. The Rampage then sat back and abandoned any attempt at extending their lead. Between the two regulation goals, the Griffins had 25 Corsi events to just 6 for the Rampage. The Griffins only tied it because of a missed penalty call, however, playing like the Rampage did puts you in a position where an overwhelmed referee missing something can cost you points. (BTW, the referee was really bad on Saturday, but to me that is the AHL’s fault. He was clearly overwhelmed, there is no way one guy can keep track of everything happening on the ice at once). Tuesday night was a example of a results loss. The difference ended up being a weird goal where Brittain makes a save and the rebound hits a defenseman’s skate. Those will happen from time to time, but they balance out over the season. In fact, I remember a few weeks ago, Yogan fanned on a shot, but the shot being slower than expected confused the goalie and it went 5 hole. Done – we are balanced. Even when it was 3-0 after 2, the process was fine, because while shots were 29-21, the Stars had 9 on PP/PK to only 2 for the Rampage. The Rampage PP really struggles when Rocco is out because they rely on him to carry it in a lot. They made some adjustments in the 3rd and the PP got going and the Stars didn’t get any more weird bounces. The Rampage then made it very interesting. 18-14 Corsi Close is bad. However, the Stars started off 10-1, so between that and their 2nd goal, the Rampage had a 13-8 advantage, which is really really good. So slow first 5 minutes or so, and then the recovered. Like I said, the proocess wasn’t bad. If the Rampage can play like they did after the first 5 minutes or so they will be just fine. I’ll be at both Texas games this weekend so you can look forward to two more of these before the playoffs start. April 17, 2015 in Analytics.